My view of homelessness is one of a person who has experienced it, and who had to fight like hell to get out of it. Sometimes I had to battle the “system” which was trying to “help” me. Here is my wish list for more awareness into the causes of homelessness. 1. I wish people would not shove their unhappiness with the greedy, materialistic rat race (and their part in it) on the homeless. If you are under mountains of debt, struggling to keep up the appearances with you fake friends by over extending yourself, and MISERABLE about your choices in this competitive world, don’t take it out on a homeless person!!! Find out who you are and get some peace in your life before you bash Joe Homeless over the head for “not getting a job”. 2. I wish agencies and charities would work together and not provide so much overlap or so much bare spots in their coverage of other people’s needs. Overlap encourages abuse of the system, and bare spots show the public that you have no idea about the needs of the people you are intending to serve. 3. I wish there were better mental health service and advocacy for people who need this help. Seems like the scammers are getting all the services and the people who really need it are dying in doorways. Get out of your offices and look for those who are truly down-and-out. They are right there, under your feet. 4. I wish all agencies that handle homeless people were filled with compassionate, fair people. Since this will probably not completely come to pass, I wish that those who are in contact with the homeless be monitored by a government agency to make sure they are not ruining someone’s life (and causing their death) by callously rejecting their petition for assistance. 5. I wish people would get off other people’s backs for feeding the homeless. If they want people to work for the food, then create small service projects for the homeless before giving them food. Starvation should not be the only option. 6. I wish government officials would seek out the views and opinions of former homeless individuals and use those ideas to set policy. Don’t ignore our hard-won knowledge! 7. I wish every homeless person knew that there is hope, and the help you need is there (if you seek it out). But sometimes you have to fight for it. Don’t wait until the world changes to be happy, just make yourself happy… one small moment at a time. T.J. Yes, it is amazing that so many charities will turn people away for the smallest of reasons, and they console themselves by referring the person to another agency or charity, which also turns the person away. There should be some checking by the government and grant givers into this. Please also, before you give to a charity… call them and ask for services, and see how they treat you. T.J.
OGDEN, Utah — Matt Tribe says when he bought one of Olive Garden’s limited edition, never ending pasta passes, it was to fulfill his love of pasta. He soon saw another benefit. “Every day I’d go get pasta, and I’d just go show up and someone’s house and brighten their life with some Olive Garden,” Tribe said. The national restaurant chain offers 1,000 cards a year as part of their Never Ending Pasta Bowl promotion. The card gives the bearer an unlimited supply of meals for seven weeks. Tribe says he came up with “Random acts of Pasta” as a way to pay it forward. “I realize it might be stupid to think, ‘I just gave them pasta, how does that make their day better?’ But somebody did something nice for them,” says Tribe. Tonight after six months of homelessness – alternating between sleeping at friends’ houses, motels, shelters, and the streets; I get to sleep in my own apartment, a place I can call home. I do not have an adequate vocabulary to describe how happy and grateful I am. How’s about a Nobel Prize for Mr. Abbott? FORT LAUDERDALE (CBSMiami) — Locals gathered outside the federal courthouse in Fort Lauderdale on Saturday to rally against the city’s homeless feeding ordinance. The group is calling for an end to, what they say is a criminalization of homelessness across the United States. They are calling for non-violent resistance to laws which criminalize homelessness until all such laws are rescinded or struck down. Following the rally, the group was scheduled to march to Stranahan Park for some food, music and speak-outs by those who are homeless. Ninety year old Arnold Abbott, was also at the event. 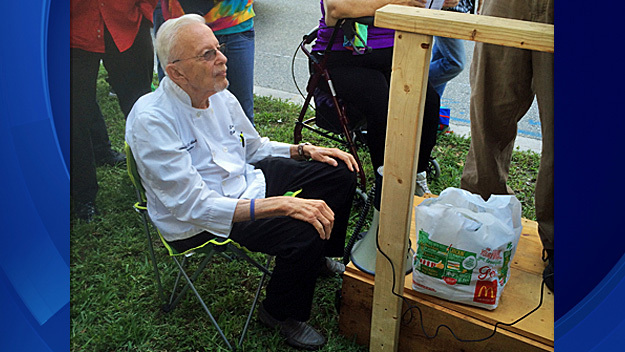 Abbott has been feeding the homeless in Fort Lauderdale for years and is locked in a battle with the city over their new law restricting public feedings of the homeless. when I slept in the post office at night, the mean, unhappy people would make a lot of noise to wake me up. That’s how I knew they were mean and unhappy. T.J.
America is not India. To quote someone from India as if they are some wise guru on the homeless situation is rubbish. They have a caste system that has kept poor people on the bottom for centuries. America is supposed to be the land of equality; if we slip into that third world, old world mindset and start throwing people away, then God help us. 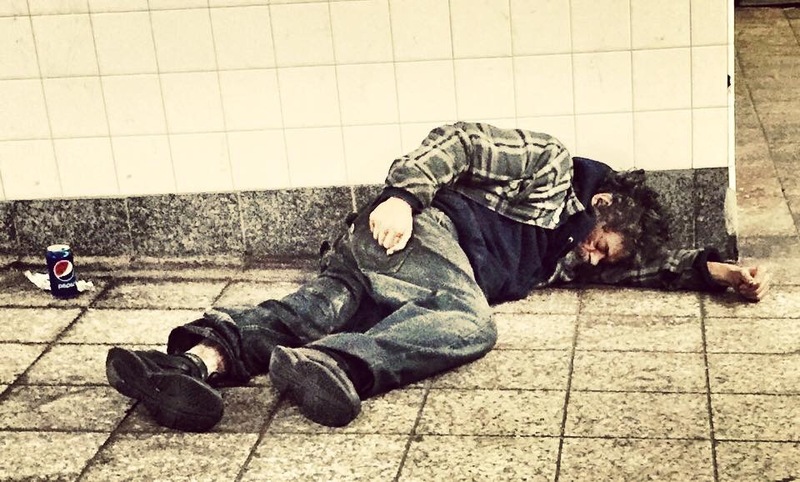 People are not victims of karma when they do things to survive homelessness and poverty; but, the people who could change the system and help may be, if they do nothing. If the pioneers could have only lived in shelters that were a standard three bedrooms and built to code, this country would have never been settled by the pioneers. 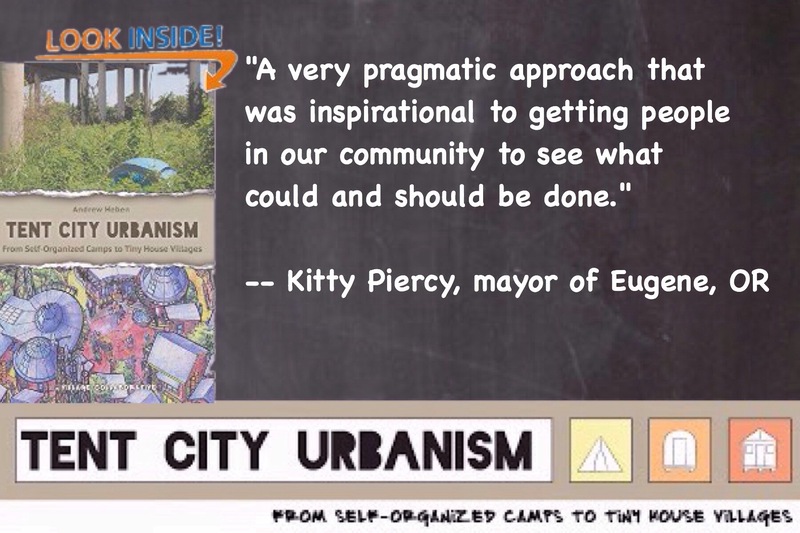 Andrew Hebin, author of Tent City Urbanism and co-founder of Opportunity Village in Eugene Oregon, spoke in Chico California Sunday on his Tent Cities Urbanism Tour. 1) Solutions to affordable housing are modular in nature and that one size doesn’t fit all. 2) Housing is much more than mathematics on the size of your space and the enmities you possess. 3) Misconceptions and generalities are pervasive and limit the will of communities as it relates to provide desperately needed affordable housing. 4) Tent Cities and Tiny House Villages are poorly understood by a general public that relies on sound bites instead of hard facts on the ground. The reality is communities comprised of people of meager income are working quite well across the United States.